The Talking Box: Come On Down!!! My earliest memories of The Price is Right stem from kindergarten. In my area, we were on the half-day system, and I was a "morning" kid. So, I got home from school shortly before noon. I was able to watch the second set of the Showcase Showdown, as well as the Showcase itself. 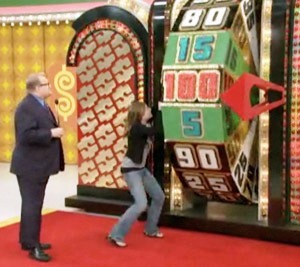 Being five years old, I had no idea how to guess the prices for the Showcase, but boy did I get excited to watch the contestants try to spin for $1.00! I was a bit ahead in math, so I was able to follow along with how much a person needed to spin on their second try, etc. I probably began watching full episodes of The Price is Right a year or so later, during the summer and sick days and things like that. I was in love with certain games, and would cheer whenever Plinko, Punch a Bunch, Path Finder, Now... or Then, Cliff Hangers (the one where the guy climbs up the mountain! ), or Spelling Bee would come on! Brief history: The show began in 1956, though there was a serious revamp in 1972, which is when Bob Barker began hosting the daytime game show (and in 2007, Drew Carey began hosting). Bill Cullen was the host before that, 1956-1965 (both primetime and daytime versions). 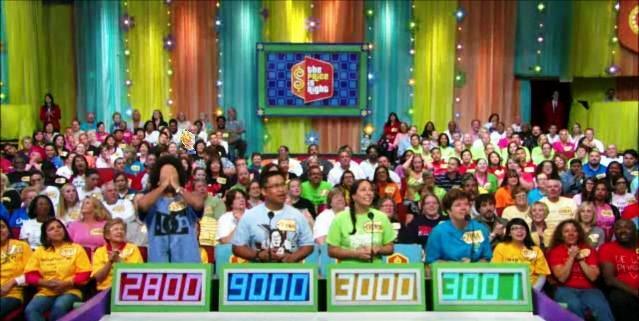 The Price is Right has been successful throughout its run, and versions have been adapted for Australia, the United Kingdom, Mexico, and other international arenas. The show originated on NBC before the move to ABC. The original game was pretty much just four contestants trying to bid closest to the value of a given item (much like the "first round" of the game we now know). However, you had to increase your bid so that it was higher than the one given before you, or "freeze" your previous one. This process was repeated over and over, with the person who accumulated the highest value of prizes being able to return and play again next episode. The game: The game that many of us know today, which has been in place since 1972, starts off with four contestants being called down to "Contestants' Row," where they play the opening game, bidding on a single item, trying to be the closest to the actual retail price (as I mentioned the original game was earlier). If someone gets it right on the nose, they not only win the prize (winner keeps the prize) but they also get $500 (originally $100 from 1977-1998). The winner also moves on, then competing in a Pricing Game. There are more than 50 pricing games that are still in rotation (some say more than 70! ), so I won't get into specifics here. If you win your pricing game, you win the prizes associated with it. Regardless of whether you win, you move on to the Showcase Showdown, which took place twice per show. But, before that, another contestant was pulled from the audience, another "Contestants' Row" game took place, then another pricing game... this system repeats multiple times as needed. Once the first three contestants from Contestants' Row play pricing games, it's time for the Showcase Showdown is a giant wheel that each of the three spins individually. The wheel has 20 spaces, each representing an amount between 5 cents and $1.00. You spin based on how much you've won so far, loser goes first. You can stay on your first spin, hoping nobody can top it, or spin twice, but you're out if you go over $1.00. If you land on the $1.00 space on your first spin, or your total equals exactly $1.00, you win $1,000 and get a bonus spin. If you land on the 5-cent or the 15-cent (adjacent to the $1.00), you win $5,000; landing on $1.00 netted you $10,000. Tied contestants spin again, until one gets a higher spin than the other. The winner holds off until this entire section is repeated, resulting in a second Showcase Showdown winner. These two square off in The Showcase, where a series of prizes are described, and the person who won more to that point gets to choose whether to bid on that set, or pass. If he passes, the other guy makes a bid and a second set of prizes is described, for the first person to bid on. If he had bid on the first set, the second set would be for the other guy. Whoever came closest to their actual prize value without going over wins. And, if you come within $250 of the price, you win both showcases! You can see whole episodes as well as clips on CBS. Notable changes to the way the game is played: In addition to the changes I've already mentioned, there are a few more differences. The bonuses when you spin $1.00 changed. In 2008, the 5-cent and 15-cent went to $10,000 and the $1.00 went to $25,000. Also, from 1974-1998, you had to be within $100 in order to win both showcases in the end. Since Drew Carey began hosting few years ago, there have been leather products on the show, which Barker was adamantly against. They're also showing more foreign cars now - Barker was big on patriotism so many of the cars were from here in the USA. Oh, and not really a change to how it's played - but any episodes with fur coats can't be aired ore released, since they partly go against Barker's animal-rights stance. Another thing that is gone is the at-home sweepstakes opportunity that used to be there. A prize package was announced on-air (with one item being handmade), and viewers at home sent in postcards, guessing the value. The closest person without going over won. This took place in 1972, 1978, 1980-1987, and 1990. 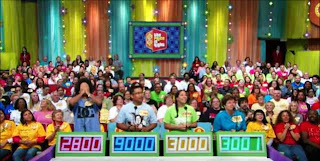 Just recently, it returned, re-vamped with ten prizes shown over the course of a week, and viewers logged onto The Price is Right website to guess. But, the most notable change of all comes from the old primetime version... they used to try and guess the prices of such outlandish things as fully furnished homes, Ferris Wheels, an island, a submarine, and even small business franchises! 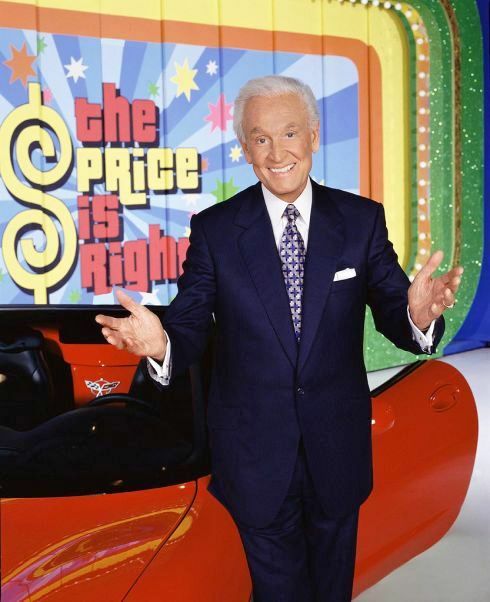 Special contestants: Someone actually won $147,000 worth of prizes in a single daytime episode, including three cars! There is at least one episode per year that focuses on those in the armed services. There's also been couple teams for Valentine's Day, mother-child teams for Mother's Day, and college-themed episodes. Favorite Rounds: I like the pricing games the best at this point. The wheel was my favorite for a long time when I was a child, but clearly I am not more interested in the actual games and winning prizes and whatnot. However, the same games that I enjoyed as a child (Plinko, Cliff Hangers, etc.) are still the ones I most enjoy seeing! I have to add Hi-Lo now, too, though. My take: Heck yeah! If they called my name, I'd be cheering and racing down! However, there are certain areas of the show where I would falter. For instance, I know nothing about boats. I'm not that good with the prices of cars. Furniture is also not my forte. So, the final showcase would be very difficult for me, so would a handful of the pricing games. I've got the grocery prices down, tho!! I might also be able to pull off Contestants' Row okay, and I have as much luck as anyone with the Showcase Showdown. And, while I'd much rather have been on the show when Bob Barker was hosting, it's a fun show, and I think it would be fun to be on! Of course, it's not actually random... they do group interviews, so I'm not sure that they'd ever pick me to be one of nine contestants to see the stage out of 325 possibilities! What about you? Would you give it a shot? What would be your strengths/weaknesses? Would you have preferred to be on during the Bob Barker era, or do you like Drew Carey as a host?